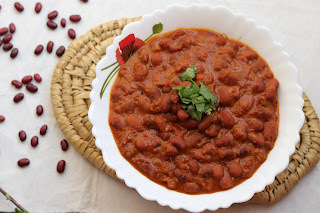 Learn how to make authentic rajma masala curry, using the most famous kashmiri rajma "Bhaderwahi Rajma". Rajma masala is one of North Indian most famous curry recipe, which tastes best with rice. 1. Soak rajma overnight or for 7-8 hours. Boil soaked rajma along with soaked water. Add salt while boiling. 2. For masala, heat 1-2 tbsp oil in a kadai. Saute ginger garlic. Add tomato puree and cool till oil separates in kadai. Switch off the flame and add beaten curd. Constantly move the masala to avoid the curdling of curd. Switch on the flame and continue to cook for 1-2 min. Add all masala and cook till the masala leaves oil. 3. Add boiled rajma in the masala and mix properly. Add little water, if required. Cook for 5 minutes and serve hot with rice or roti.